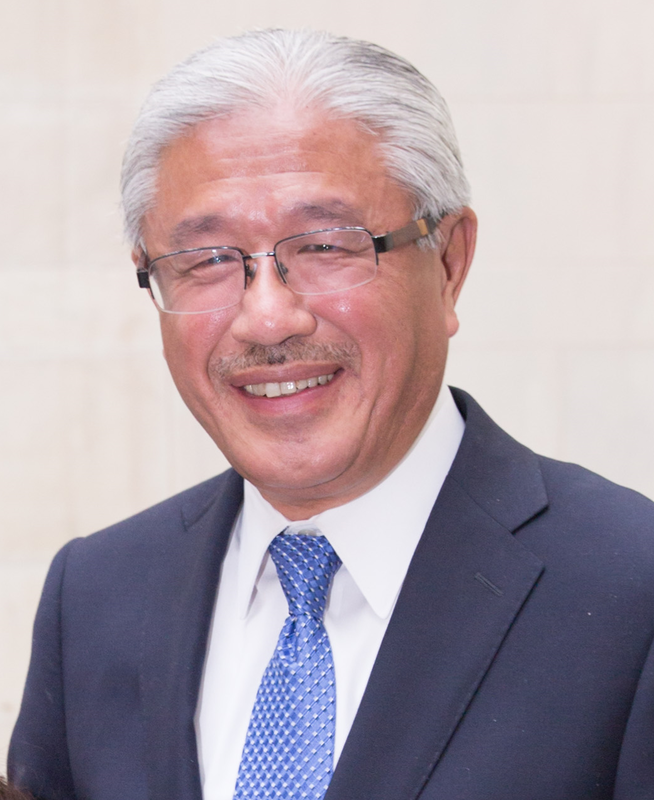 I am delighted and honored to deliver my yearly report to you as the final president of the Institute of Medicine (IOM) and the very first president of the National Academy of Medicine (NAM). Not many can claim to be both the first and the last simultaneously, but here I am. As you all know, we are now a full academy. This is a momentous achievement that recognizes the incredible scientific and health policy contributions of you, our esteemed members. Along those lines, let’s congratulate the latest of the many Nobel laureates among our ranks: Paul Modrich, an NAM member for 12 years (also an NAS member) and a faculty member at Duke University School of Medicine. Our members are truly “the best and the brightest,” and I’m so proud and privileged to be here with you all today. As individuals, your credentials are certainly impressive. But, to quote the 19th-century poet Satoro, “Individually, we are one drop. Together, we are an ocean.” Many of you here have experienced this firsthand. By coming together through the Institute of Medicine, and now the National Academy of Medicine, you’ve seen your expertise and influence multiplied a thousand times over. Together, we can and will continue to improve health and health care in this country and around the world. Now, as the National Academy of Medicine, we can also more easily join forces with our fellow academies of sciences and engineering. Together, we can more rapidly identify and respond to complex issues that cut across institutions, agencies, disciplines, and national and international borders. Becoming a full academy is an accomplishment that we should all celebrate. But I’m sure many of you are wondering: What does this reorganization mean as we move forward? What is in the future for us as the NAM? Today, I’d like to share my vision for the NAM—a vision largely shaped by your input and that of many of our most important stakeholders. And, although the transition is still a work in progress, I ask you to join me in making this vision a reality. Before we talk about the future, let’s take a minute to remember how we got here. And we wouldn’t be where we are today without the IOM and its many pivotal contributions to health and medicine. At this time, I’d like to acknowledge past IOM presidents here with us today—Sam Thier, Ken Shine, Stuart Bondurant, and Harvey Fineberg—who were so key in building the IOM’s success and legacy. As you know, the IOM’s mission is to “advise the nation and improve health.” Each IOM report begins with a quote from the 18th-century German writer Johann Wolfgang von Goethe: “Knowing is not enough, we must apply. Willing is not enough, we must do.” We seek to do more than simply advise; our aim is to have a positive impact on policy and practice—and, ultimately, to improve human health. Indeed, we have much to be proud of, having been the architects of significant progress in policy, care delivery, science, and medicine. The IOM’s work informs and improves every aspect of health and medicine—from basic research to the delivery of care, from improved treatments to more effective prevention. Our reports guide policy changes in government and other organizations, provide evidence on which to base action, and reframe how the world thinks about health problems and solutions. Here are just a few examples. Our Quality Chasm Series is widely credited with having launched the modern patient safety movement and transformed the way we deliver care. It all started with the first report in the series—To Err is Human—which was released 15 years ago. 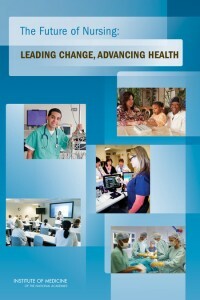 Just last month, we released the latest report in this series: Improving Diagnosis in Health Care. That’s 15 years of sustained engagement with this important issue. The Future of Nursing is another of the IOM’s most well-known and influential reports, and has led to major changes in nursing education, practice, and care delivery. To advance the report’s recommendations, the Robert Wood Johnson Foundation and AARP launched a nationwide campaign for action. You’ll be pleased to hear that 21 states plus the District of Columbia now give full practice authority to nurse practitioners. Our reports have resulted in national standards of care, served as the basis of almost all federal and state food and nutrition programs and policies, and increased the availability of clinical preventive services for women. We are proud that we have continued this impressive trajectory in the past year, during a time of major organizational transition. Indeed, this year has been a busy one for the IOM. We’ve weighed in on a remarkable spectrum of issues and released 81 consensus reports, workshop summaries, and workshops in brief. As you may know, during my first year as president of the IOM, I embarked on a year-long Listening Tour across the country. I visited 9 cities, and in each location I had a chance to hear from four main constituent groups: NAM members, private-sector leaders, community health providers, and the public. The goals of the Listening Tour were to raise the visibility of the IOM, to expand our network, and to hear about issues that matter to people. Among the many issues that were raised, one that consistently arose was the need to increase our dissemination and the impact of our work. In response, my team and I have placed great emphasis this past year on making sure that our reports are effectively disseminated so that they can be translated into tangible impact. We have implemented a process by which each study, before it is even begun, has a dissemination plan in place so that we are reaching not only a large number of people, but also the “right” people—people who are positioned to take our recommendations and transform them into action. The following are some examples from this past year. In addition, NAM and IOM will commemorate together the 15th anniversary of the To Err Is Human and Quality Chasm reports, as well as explore themes from the latest report on diagnostic errors at this year’s NAM Rosenthal Symposium, which will take place on December 10 here in Washington, DC. As I mentioned, we released Improving Diagnosis in Health Care last month. To make sure the messages of this report reach not only clinicians but also the public, we developed a toolkit for patients and a video of patient stories that highlight the importance of communication between patients and clinicians in the diagnostic process. The video is very compelling and was even featured in the Washington Post. If you have not yet seen it, I highly encourage you to watch it. Last year, I told you about the success of the report Dying in America. In March, we held a major national summit for health leaders, policy makers, and other stakeholders to discuss how the recommendations from the report could be implemented and what barriers exist that might prevent them from becoming a reality. As a result of the summit, nearly 50 organizations have formally committed to action, and the report no doubt influenced Medicare’s decision to reimburse providers for time spent counseling patients about end-of-life planning. In addition, we are in the process of developing a Roundtable on Quality Care for People with Serious Illness in order to convene stakeholders and decision makers on an ongoing basis. As you are well aware, all of these accomplishments took place during a time of significant change for our organization. This past year will be remembered as the year we became the NAM. The idea of forming a National Academy of Medicine dates back to the IOM’s inception 45 years ago. In those 45 years, we have twice attempted to attain academy status without success. Therefore, the formation of the NAM on July 1, 2015, is a historic achievement that recognizes the organization’s significant contributions to science and medicine, as well as the great distinction of NAM members. Our time has come, and we must prove to the world that we are deserving of the recognition. So, how does the creation of the Academy change the way we operate? First, it provides us with equal responsibility for the collective oversight of all divisions of the National Research Council (NRC). In addition, we can now elect our own officers, rather than having them be appointed by the NAS president and NAS Council. Under the old structure, the IOM was an outlier because both its membership and its consensus study and convening activities were housed together. But this was a disadvantage, because the IOM did not have an equal role in NRC governance. Now, as the NAM, we do. 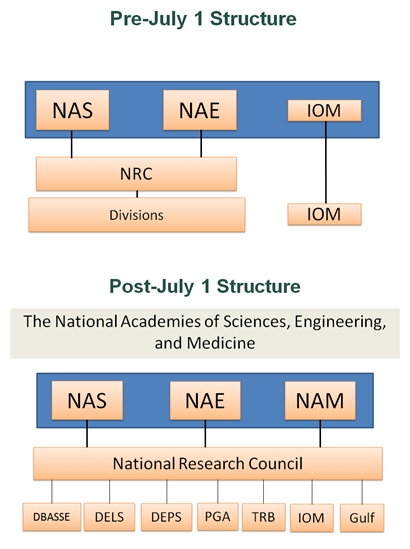 As you can see, the NAM is now aligned with the NAS and the NAE, under the umbrella of a more integrated National Academies of Sciences, Engineering, and Medicine. As a condition of the reorganization, the programmatic part of the old IOM becomes a new division in NRC (now rebranded as the National Academies of Sciences, Engineering, and Meidicine) dealing with policies on health. And, because the name “Institute of Medicine” is so strongly associated with rigorous, independent, and authoritative studies, and in response to the strong desire of our membership and staff to maintain the IOM brand in transition, we have decided to retain the name to describe the new program division for approximately one year. Even for all of us insiders, explaining our complex structure is difficult. The concurrent use of both the NAM and IOM names has undoubtedly been confusing for some people. Furthermore, other Academies program divisions do not brand their work independently, which raises questions of Academies-wide brand consistency. We have to involve the leadership of the NAS, NAE, and NRC in many shared decisions, including decisions about branding. As I’m sure you can imagine, there is not always consensus on every issue, and what happens in the future with the name of the division is yet to be determined. Navigating these complex issues while also building a strong and dynamic program portfolio for the NAM, all with a very small team of dedicated staff, has been a challenge. My team and I have been working very hard to ensure a smooth transition. There are many internal challenges related to branding, financing, communication, and division of labor. With the exception of the membership office, all other operational functions were located and have remained with the IOM division. Therefore, we have focused in the last few months on building the new academy infrastructure, including communication, development, and finance and administration shops for the NAM. I want to stress emphatically here that this transition is not about separation. We are working hard to maintain a seamless connection between the NAM and the critical work of the IOM division. At the end of August, the senior staff of the NAM and the IOM division participated in a joint offsite retreat. We had frank and sometimes difficult conversations; we put in long hours asking tough questions; and we also found some much-needed time to socialize and bond. In the end, we all agreed on and committed to ways in which the NAM and the new IOM division can support each other’s work. I can assure you that NAM and division leadership share an enthusiastic commitment to our future together. For now, let’s get back to the main question: why does this reorganization matter? It matters because the NAM can now have even greater national and international impact. As NAM members, you will have expanded opportunities to work with other Academies divisions in new and innovative ways. A perfect example of this is the Academies-wide Human Gene-Editing Initiative now under way. This is a really exciting collaboration initiated by the NAM and NAS in response to a cutting-edge scientific and medical issue. I’m sure you’ve heard about the research being done with powerful new gene-editing technologies, such as CRISPR-Cas9. These technologies hold great promise for advancing science and treating disease, including potential cures. But they also raise concerns and present ethical, social, and regulatory challenges, particularly because of their potential to be used for gene engineering in human germlines and embryos. This summer, NAS president Ralph Cicerone and I appointed an advisory committee, chaired by Dr. David Baltimore, to guide the activities of the initiative. The initiative includes an international summit, which will be held in early December, to obtain multinational perspectives on recent scientific developments in human gene editing and the associated ethical and governance issues. Because this issue crosses not only disciplinary but also political boundaries internationally, we have invited the Royal Society of the UK and the Chinese Academy of Sciences co-sponsor the December event. In addition, a multidisciplinary, international committee, co-chaired by Richard Hynes and Alta Charo, will conduct a comprehensive study of the scientific underpinnings and clinical, ethical, legal, and social implications of human gene editing. Many NAM members are actively involved with this important initiative. Such rapidly moving advances in science and medicine make the creation of the NAM especially timely. So do the immense challenges that are shaping today’s health landscape: an increasing disease burden due to noncommunicable chronic diseases, aging, rising health care costs, and persistent health inequalities. The National Academy of Medicine is in a perfect position to steer this rapidly evolving health environment toward progress on many fronts. The NAM’s independent status and unique interface with academia, government, industry, and civil society provide the platform and resources necessary to impact health both immediately and in the long term in our own nation and beyond. To guide us, the NAM has developed a new statement of principles—leadership, innovation, and impact for a healthier future—which encapsulates the way we will identify, determine, and implement strategic priorities. We have worked hard over the past several months to launch new initiatives that align with these principles. Let me give you a sense of what we’re doing in the new academy. First, we have just launched an exciting program called Innovation to Incubation (i2I). i2I aims to increase the Academies’ innovative environment and culture by providing a mechanism for generating new ideas, incubating actionable solutions, and translating forward-thinking concepts into formal programs and initiatives. Our Leadership Consortium for Value & Science-Driven Health Care is another example of innovative work taking place at the NAM. The Consortium provides a trusted venue for national leaders in health and health care to work cooperatively toward a common commitment to effective, innovative care. In addition, through innovation collaboratives, the Consortium engages key stakeholders in cooperative activities to advance science and value in health and health care. Finally, innovation will require us to engage people of diverse generations, cultures, and experiences. The NAM has several fellowships that bring diversity of age and experience to the Academies, and we are exploring new ways to engage the younger generation and develop future health leaders. 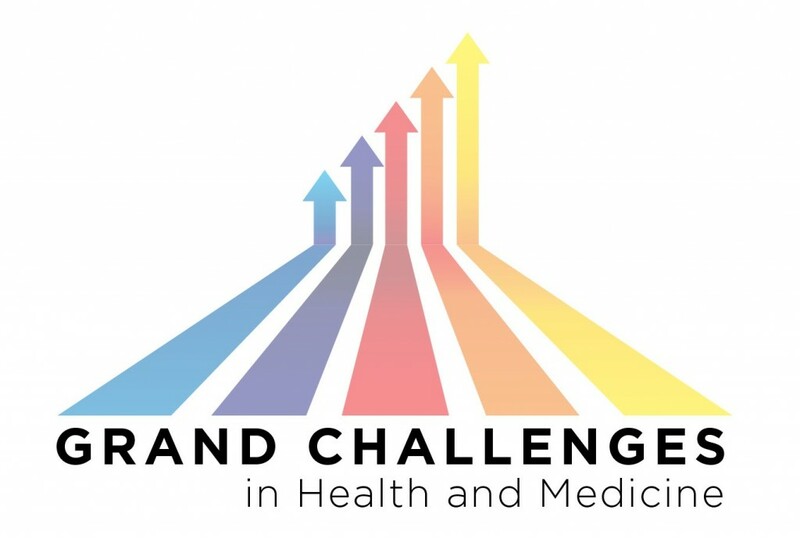 For example, we are connecting with local university students through our DC Public Health Case Challenge to promote interdisciplinary, problem-based learning around a public health issue that faces the DC community. As we position NAM to lead, innovate, and increase impact, we have developed three main goals for the NAM over the next 5 years. The first is to identify and respond to urgent priorities in health and medicine. We need to be ready and prepared to assemble resources and provide guidance when it is most needed. The Human Gene-Editing Initiative is exactly the type of priority I’m talking about. We can’t wait for outside parties to commission our work. We need to develop adequate internal resources that allow us to provide advice on what we identify as the most pressing health problems. Preparing for and improving response to a crisis such as the Ebola outbreak in West Africa is another example. This recent epidemic took the lives of more than 10,000 people. The countries most affected have suffered economic and social losses that will take years to recover from. We know that much of this suffering could have been prevented. And we know that it’s not a matter of if, but when, the next global health crisis will occur. The question is, How do we get world leaders to take the actions needed to make sure that we’re better prepared next time? That’s why the NAM has launched the Global Health Risk Framework initiative. With encouragement from World Bank Group president Jim Yong Kim, Director-General of the World Health Organization Margaret Chan, Rockefeller Foundation President Judith Rodin, and with the support of seven foundations, the NAM has organized a multinational, independent, multi-stakeholder commission to recommend a more effective global architecture for mitigating the threat of epidemic infectious diseases. This initiative will build on lessons learned not only from the Ebola outbreak but also from other pandemics to develop a comprehensive framework for improving our response to future global public health threats. This commission will develop a comprehensive set of recommendations and propose a preparedness and response plan. 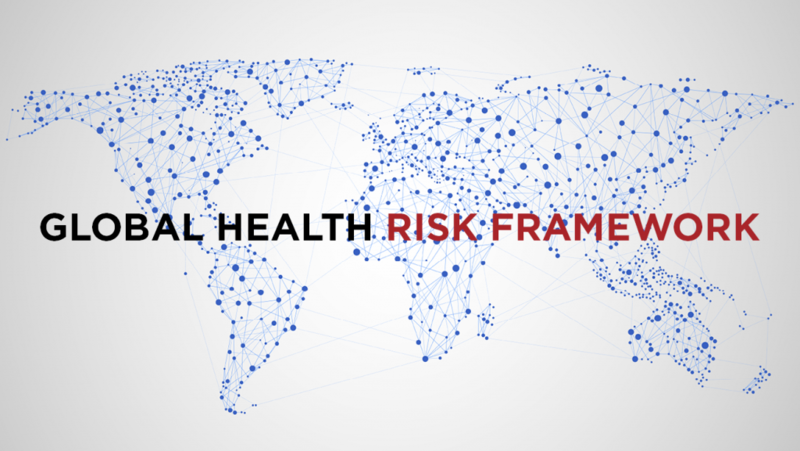 To ensure that our framework will have an impact on future pandemic preparedness and responsiveness, we are working to ensure that our report is seen by key decision makers and is on the agenda at major international meetings, such as the G7 and the World Health Assembly. The NAM’s second goal is to advise the nation and the world on the future directions for health and health care. Here in the United States, we’re a year away from electing a new president and a new administration. Now that the Affordable Care Act has been enacted, we must thoughtfully consider the existing gaps and key areas that still need to be addressed where nonpartisan, evidence-based advice could bring about positive change. Mark McClellan, an NAM member, and I are co-chairing the NAM’s new initiative, Vital Directions for Health and Health Care, to envision and recommend the future of health care. The steering committee includes experts from a range of disciplines, including many eminent NAM members and former politicians and government leaders. The initiative will produce a series of publications, symposia, and a synthesis document that will offer a conceptual framework to identify areas of opportunity and explore national policies that are immediately actionable that would assist the next government’s plan for improving health and health care. I’m also excited to announce that we have just received a very generous $10 million gift from the Robert Wood Johnson Foundation to establish a multiyear Culture of Health program. The goals are to identify the conditions and solutions needed for all to achieve equitable good health and well-being, and to examine the policies and practices needed to support a culture that promotes health. The grant will establish a Culture of Health endowment and support project activities, including IOM consensus studies related to the program. The first consensus study will examine health disparities in the United States and identify community-based solutions. The NAM’s third goal: Serve as a curator for “big ideas” and inspire the community to unite around shared priorities and big—even audacious—goals for health and medicine. These days, a lot of people in health and medicine are hunkered down, operating in siloes that focus narrowly on their own problems. The world needs aspirational and audacious goals to inspire confidence that we can do more, much more, to change the course of health. Many of us believe that major breakthroughs can be achieved through partnerships of the best minds across all sectors, sharing a common vision and goals, working collectively to address big, bold problems, creating the right environment with robust resources and aligning incentives and value. That’s why the NAM is initiating a Grand Challenges in Health and Medicine initiative, which is chaired by NAM member Bob Horvitz and includes other NAM Council members. This initiative is still in its formative stage, and we want to make sure we are being thoughtful about the challenges themselves and the process by which they are developed. I see this as a long-term NAM initiative involving several phases. In the first phase of this initiative, the NAM and its partners will identify the most pressing challenge areas through a transparent process that seeks input from many perspectives. Fittingly, on October 18 in his address to NAM members, Jim Kim challenged us to address three areas where the Academy can have a profound and lasting impact. These are: security, equity, and delivery. And the focus of our scientific program on October 19 is aging. All of these are potential grand challenge topics worthy of consideration. In the second phase of the initiative, the NAM will catalyze action toward solutions by stewarding collective strategies from multiple stakeholders in policy, business, philanthropy, academia, and the general public. We believe that the NAM’s Grand Challenges will inspire bold thinking—and actions through public-private partnerships—to change the course of health. As you can imagine, it will take resources to make this organization more dynamic and better able to respond to timely issues. In the past, we have relied heavily on internal resources, but we are going to need external support as we move forward. In the next year, my intention is to focus my efforts on increasing our development activities, and I will need your help. As we look ahead to an exciting future, we must remain connected to our past. The NAM and its members must continue to work closely with the IOM division on reports and programmatic activities. I’m sure you’ve noticed just how integral the division is to just about every one of the NAM initiatives I’ve just discussed. From the Global Health Risk Framework to the Human Gene-Editing Initiative; from the to the Culture of Health Program to our fellowships; many of our programs will integrate resources from the IOM division. The connection between the NAM and the IOM division is strong and will only grow stronger in the future. Although our organization is changing, our common purpose remains the same. In summary, I believe that, as an academy, we are in a better position now to leverage our resources, increase our impact, and respond more quickly to urgent issues. The future is very bright indeed. I’d like to conclude by stating the obvious: This has been quite a year for all of us. We’ve become a full-fledged academy. It has been a year of big accomplishments— and big challenges and big adjustments—a year of meaningful impact and bold plans for the future. None of this would have been possible without your unwavering support and dedication. As I said earlier, when I began my presidency a year ago, I embarked on a year-long listening tour across the country. So many people came forward to share their ideas, all of which have greatly informed and shaped my vision for the National Academy of Medicine—leadership, innovation, and impact. Please, let’s keep these conversations going. Your input always has been and always will be essential for our success. I hope you’ll attend one of many regional gatherings in the future and share your views there. But you don’t have to wait for a meeting if you want to share a great idea or insight with me or the NAM staff. Share your feedback with me directly, anytime. Finally, in addition to the NAM’s bimonthly newsletter, which provides an overview and updates of our major activities and initiatives, I have recently started sending a monthly letter to members to have ongoing conversations with you and to keep you up to date on what’s going on from my vantage point, as well as a blog for our staff. We want to hear from you, and we’ll do our best to keep you informed on major initiatives as we progress. This reorganization has made us more capable than ever before of bringing about real change. We have a tremendous amount of work ahead of us. But with your support, I know it can be done. Remember the African proverb: “If you want to go fast, go alone. If you want to go far, go together.” Together, we will go far. We will change the course of health and achieve our mission of improving health and well-being for everyone.